﻿ Best Price on Hotel & Casino Flamboyan in Punta Cana + Reviews! Featuring a tour desk, Hotel & Casino Flamboyan is located a 25-minute walk from El Cortecito and Los Corales beaches. Each air-conditioned room offers tropical decor with cable TV and a refrigerator. 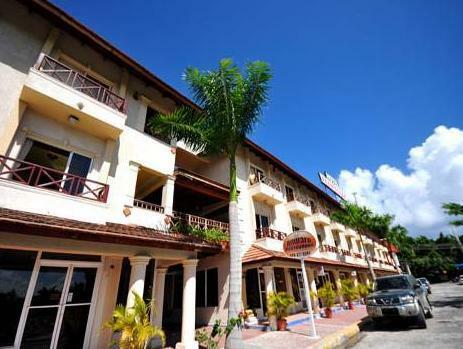 Hotel Flamboyan features cable TV and a balcony in every guest room. The private bathroom is equipped with shower/tub combination. Breakfast is served daily in the hotel's restaurant from 7:30 until 10:30. Guests will also find buses and taxis nearby for transportation to local sights. The Palma Real shopping mall is 1.9 mi from the hotel. El Cortecito Beach is a 10-minutes' bus ride away. This property is close to Coral Highway. The hotel itself is very good. Unfortunately, the area around it is a little down at heal. The big resorts sit between the hotel and the sea and they don't let you though without a pass. Therefore it was a two mike journey to get to a beach when there was one only 5 mins walk away. I only had breakfast, so my score on the food reflects that. The breakfast was ok and the staff friend sly and helpful. The bars and unofficial drinking places compete to out-volume each other with mainly Latino music. Steve's bar, a 5 min walk, was good although full of working girls late at night. But they were polite and smiled and didn't bother you if you said no. The hotel is still in central location in El Cortecito, not far from intersection to reach public traffic, restaurants, nightlife and discotheques. The beaches are some kilometers away, since big hotel chains block the direct way. The rooms of Flamboyan are big, with TV, fridge, table, chairs and balcony. Staff is efficient and funny, but some foreign language skills would be great. Breakfast is choice of continental and dominican style in different variations. At all I enjoyed my stay in Flamboyan. Took a while for the water to get hot in the shower and would not stay hot for long.